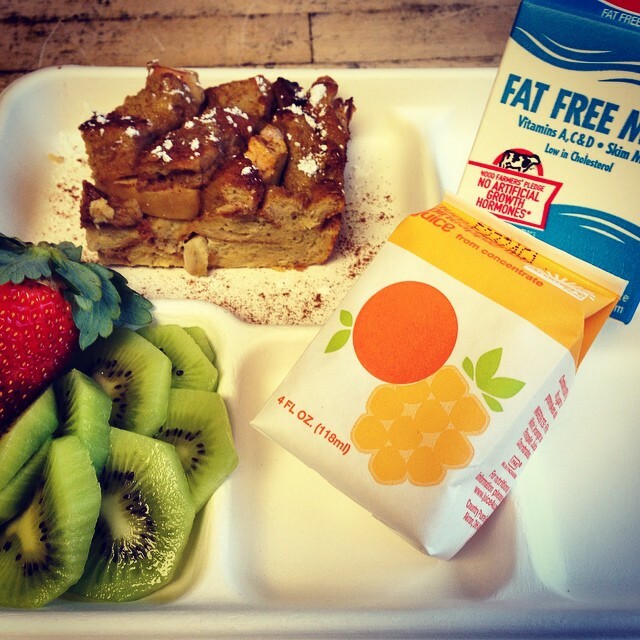 As a Registered Dietitian (RD) who has dedicated 30+ years of work and volunteer life to child nutrition, I believe flavored milk has a place in school meals. Disclosure: I am proud to work with the National Dairy Council and regional dairy councils, including Western Dairy Association. However, all the opinions here are my own. This blog was first published as Guest Blog: No Need to Remove Flavored Milk. First, the facts about today’s flavored milk in schools: This is not the chocolate milk served ten – or even five – years ago. Dairy processors have responded to nutrition concerns and continually renovate their products. From 2006 to 2014, calories in the flavored milk served at school decreased by nearly 28 percent to 120 calories per 8 ounces. This is only about 35 more calories than fat-free white milk. The most common fat-free chocolate milk served in US schools has 120 calories, no fat or saturated fat, and only 18 grams total sugar. That’s 12 grams of lactose and just 6 grams – 1½ teaspoons of added sugar – per 8 ounces. It’s important to remember that all milk has 12 grams of natural sugar(lactose) straight from the cow! Secondly. the real nutrition issues: While some US children are getting too many calories for their activity levels, many are under-nourished. The 2010 Dietary Guidelines for Americans listed four nutrients of concern for both children and adults: calcium, vitamin D, potassium and dietary fiber. Our low consumption of these nutrients can affect our health today and in the future. Just like white milk, flavored milk provides three of the four nutrients of concern – all of them except dietary fiber. All types of milk are excellent sources of calcium and vitamin D, and good sources of potassium. All are nutrient-rich beverages, packed with many other nutrients kids need for strong bodies – protein and phosphorus, along with vitamins A, B12, riboflavin and niacin. Banning flavored milk could potentially lead to a small reduction in calories consumed by kids at school. However, it also can have serious unintended consequences as documented in the recent study of 11 Oregon school districts. When flavored milk was removed, total daily milk sales declined by nearly 10 percent. Although white milk sales increased by 161 cartons per day, almost 30 percent was thrown away. Eliminating chocolate milk was also associated with about 7 percent fewer students eating school lunches. I am not surprised by these results. They confirm previously published studies and the experience in many cafeterias. Flavored milk bans do all the wrong things in child nutrition programs. We need more nutrient-rich food for hungry students, more students who are well-nourished and ready to learn – and fewer expensive-to-replace nutrients dumped into trashcans. Finally, working together to improve nutrition in schools: There has been a revolution in school nutrition programs across the USA, but we have still have plenty of work to do, especially in low-income, at-risk communities. Want kids to consume less sugar at school? Let’s provide nutrition education for families (lots of sugar is brought to cafeterias from home). Let’s implement USDA’s Smart Snacks in School rules and shift the focus toward smarter choices everywhere on school campuses. Flavored milk is not the most significant source of added sugar in children’s beverages by a long shot. Soft drinks, sport drinks and juice drinks have more sugar and fewer nutrients. Want students to drink more white milk? Forget bans. Let’s institute positive nutrition and culinary education into the curriculum, Let’s use smart marketing techniques to make white milk the more convenient choice at the front of milk coolers. Let’s not put nutrient-rich milk in the garbage and throw important nutrients out with misplaced concerns about small amounts of sugar. Want healthier kids, schools and communities? Let’s put our passion for child nutrition toward effective partnerships on positive ways to improve access to delicious nutrient-rich at school and at home. Let’s look for ways to get kids active before, during and after school with programs like safe routes to school and active recess. Fuel Up To Play 60 is great way to bring nutrition and physical activity to schools – along with grants to purchase equipment and training to implement sustainable changes. Let’s stop wasting our time, resources and food on negative nutrition campaigns. Let’s work together to make the learning connection for all children – because we know that healthier students are better students. We hear lots of talk about breakfast being the most important meal of the day, especially for children in school. And, when we talk about childhood hunger, most of the conversation is again about insuring that food insecure children have access to school breakfast. But, what about school lunch? Is lunch any less important than breakfast at school? 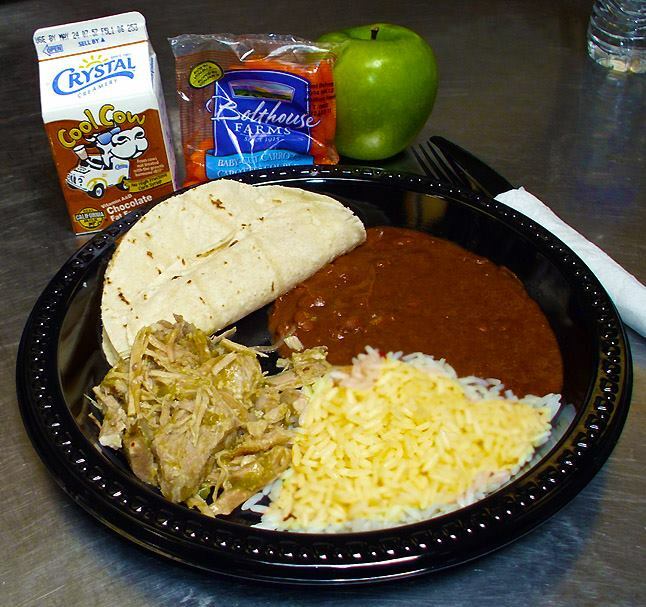 School lunch is just as important for focus, concentration and learning as breakfast – just in the afternoon instead of the morning. More children have access to school lunch than school breakfast, but sadly many children may not have enough time or the right atmosphere to actually eat and enjoy the lunch they are served. 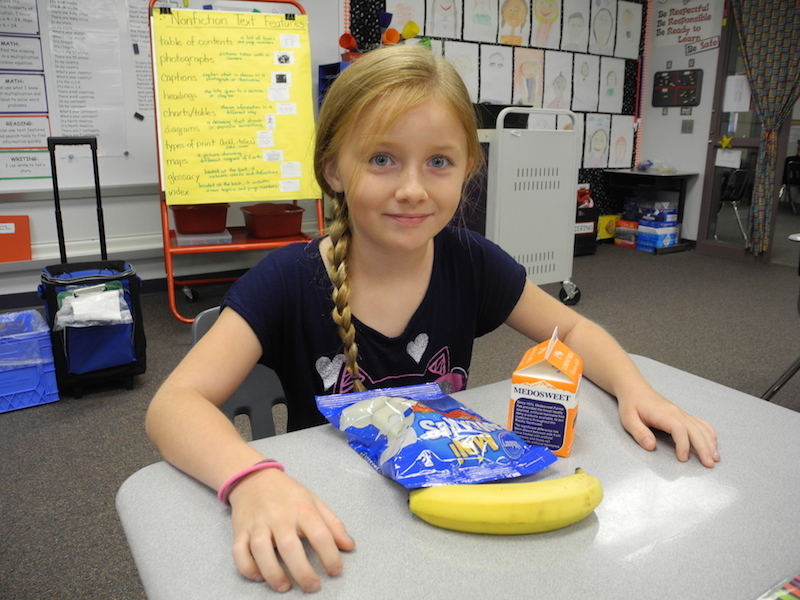 Experts agree that students need at least 15 to 20 minutes of seat time for lunch. Unfortunately many children have 10 minutes or less to sit and eat at lunchtime – and often the cafeteria is loud or managed more like a prison with whistles, lights out and silence for bad behavior. The good news is that some schools are creating Comfortable Cafeterias, which encourage students to socialize and enjoy their lunch – without being pressured to eat or to hurry. 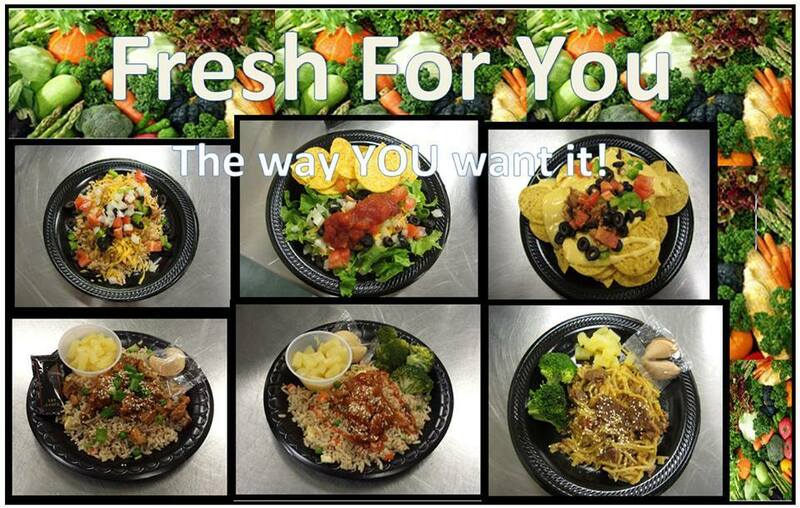 I have worked with Montana Team Nutrition on resources for Pleasant and Positive Mealtimes. The goal is make cafeterias inviting places for children to eat – so that the food goes into them rather than into trash cans. It is only nutrition when they eat or drink it! 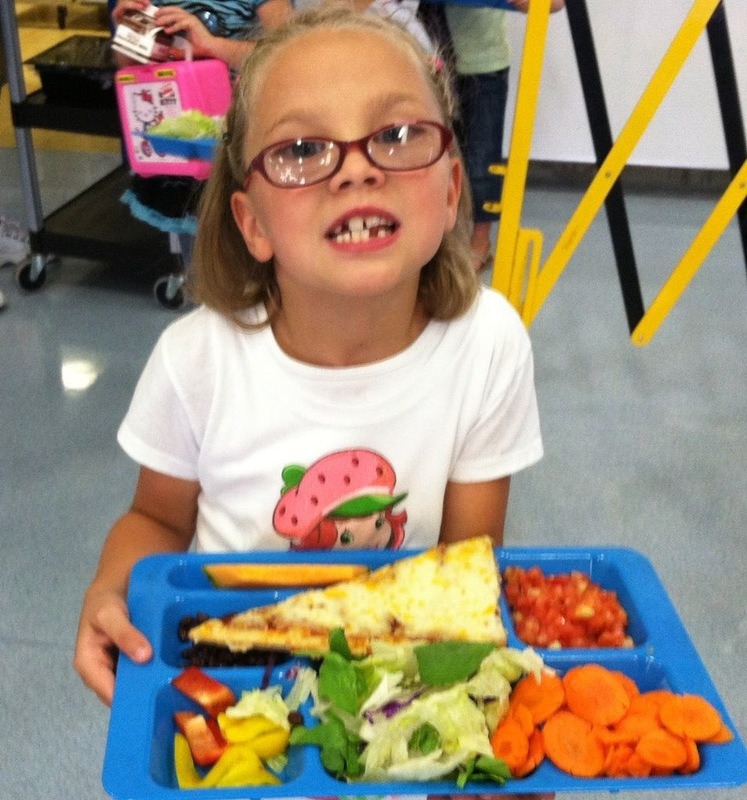 Just look at the wonderful tray that this student in Bethel, Oregon, chose on the lunch line and consider for a moment how long it will take her to eat it – even without distractions from other students and cafeteria aides! With a a beautiful lunch like this, children need time and encouragement to eat, so they can pay attention and learn in the afternoon. Want the low-down on the benefits of breakfast for school-aged children? Just ask those on the front lines of education – classroom teachers. That is what Share our Strength did in the No Kid Hungry 2012 Teacher’s Report Hunger in Our Schools. 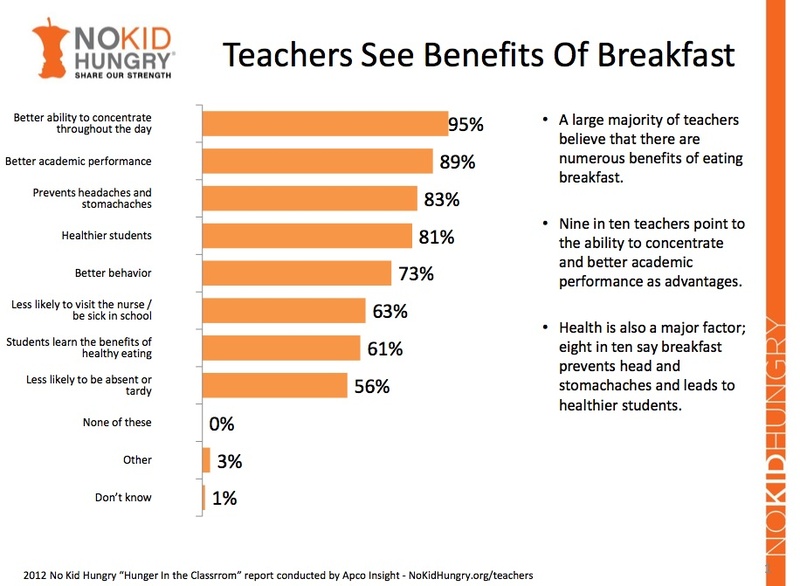 Teachers know the realities of hunger in America’s classrooms – and they know the educational, behavioral and health benefits of breakfast (see graph below). What they may not know is that school breakfast also helps to fill the nutrition gaps experienced by US children and teens. According to the 2010 Dietary Guidelines for Americans Advisory Committee Report, American young people, especially teenage girls, have numerous nutrient ‘shortfalls.’ Many are not getting enough vitamin A, C and E, magnesium and phosphorus. Even more are lacking the four nutrients of concern: vitamin D, potassium, calcium and dietary fiber. The good news it is that a simple school breakfast – fruit, whole grain cereal or bread, and low-fat dairy – helps to fill those nutrient gaps. School breakfast also provides the protein and energy that students need to focus, concentrate and learn until lunch time. Such a simple meal – with so many breakfast benefits!